After at least four consecutive weeks of growth, the three major domestic indexes all lost ground this week. The S&P 500 was down 0.44%, the Dow lost 0.49%, and the NASDAQ declined 0.15%. Meanwhile, international stocks in the MSCI EAFE grew by 0.38%. This week, the Fed meets to determine whether or not to raise benchmark interest rates for the first time in 2017. Right now, the market gives a 93% chance of a rate hike. In this update, rather than analyzing what lies ahead or what happened last week, we would like to acknowledge just how far the U.S. economy has come since 2009. On March 9, we marked the 8-year anniversary of when markets during the Great Recession hit the bottom on their lowest day. At that point in the economic meltdown, the Dow and S&P 500 had both lost more than 50% of their value since October 2007. Every investor likely remembers the fear that gripped the U.S. and global economies, as questions lingered of how low we could go. Today, we can see just how far the markets and economy have come since March 2009 - and the growth investors could have missed if they avoided the markets. Take, for instance, the S&P 500. On March 9, 2009, the index fell to 676.53. Eight years later it rebounded to 2364.87. With reinvested dividends, that growth represents an average annual increase of 19.45%. And the fundamental data tells a very similar story. March 2009: We learned the economy had fallen by a 6.3% annual rate during the fourth quarter of 2008 - its largest decline in 26 years. Today: GDP recovery has been more plodding than many people might prefer, but nonetheless, nearly every quarter has shown growth since 2009. And over the past two years, GDP has increased at a 3.2% annual rate. March 2009: The median home price was $169,900. Today: The most recent data from January 2017 indicates that median home prices have increased to $228,900 - a 34.7% increase since March 2009. March 2009: The unemployment rate was 8.7% and would climb to 10% by October 2009. Today: The most recent data from February 2017 shows an unemployment rate of 4.7%. March 2009: The economy had lost millions of jobs during the recession and would continue to lose millions more throughout 2009. Today: As of February 2017, the economy has added nearly 12 million jobs since March 2009. Throughout this economic recovery, people have seemed concerned the bull market was about to end. 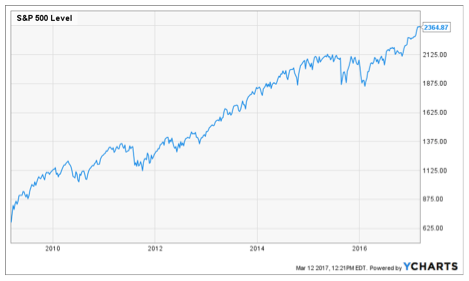 When discussing the bottom of the market 5 years ago, in the March 12, 2012 Weekly Update, we wrote about many analysts' worries that a pullback was imminent. Even last year, one MarketWatch columnist wrote an article titled "Happy Birthday Bull Market - Now Write Your Will," warning that the markets would not reach new peaks in the near future. The S&P 500 has gained around 19% in the months since then. Of course, no one can predict exactly when this bull market will begin to decline. And at 8 years old, only one recovery has lasted longer since World War II. As always, we will continue to offer the advice we believe suits your best interests in every market environment: Focus on your long-term goals and personal needs, not headlines and emotions. We have come a long way in 8 years, and we will continue to guide you through the market's changing times and inevitable fluctuations. If you have questions about where you stand today or how to prepare for tomorrow, we are here to talk.